Porsche is celebrating a special anniversary of the 911 sports car at the International Motor Show (IAA) in Frankfurt in September with a commemorative 50 Years Edition – half a century since the iconic coupé made its debut in the German city. Appropriately, the special model will be limited to 1,963 cars. In 1963, Porsche presented the original model to the public. Since this first announcement – initially as the type 901 – the 911 has excited automotive fans across the globe. Porsche will unveil the limited edition model to coincide with the 50th anniversary of the 911 at the IAA in Frankfurt, which opens its doors to the public on 12 September, 2013. Like the first coupé, the 911 50 Years Edition combines a distinctive silhouette with a rear-mounted, flat-six engine and rear wheel drive. Yet its efficient performance, active sports suspension and exclusive body styling add contemporary appeal. Over seven successive generations, the Porsche 911 continues to resolve apparent contradictions – such as between tradition and innovation and performance and efficiency – andhas become renowned as the quintessential benchmark sports car. 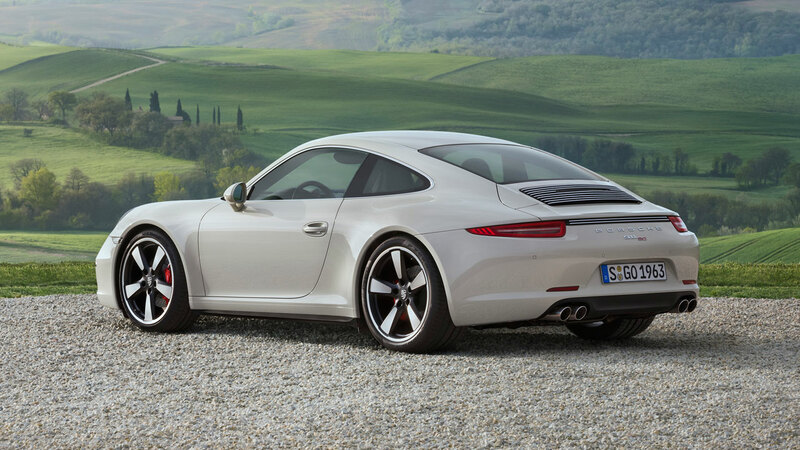 This special anniversary 911 is based on the 911 Carrera S, but is clothed in the wider body – 44 mm broader across the rear wheel arches – that is typically reserved for the all-wheel drive Carrera 4 models. The unique exterior styling is combined with features that have contributed to the 50-year success story of the car. For example, the Porsche Active Suspension Management (PASM), with special tuning to complement the increased track width, adds to the exceptional cornering dynamics. The car also features a sports exhaust system for increased emotional character. 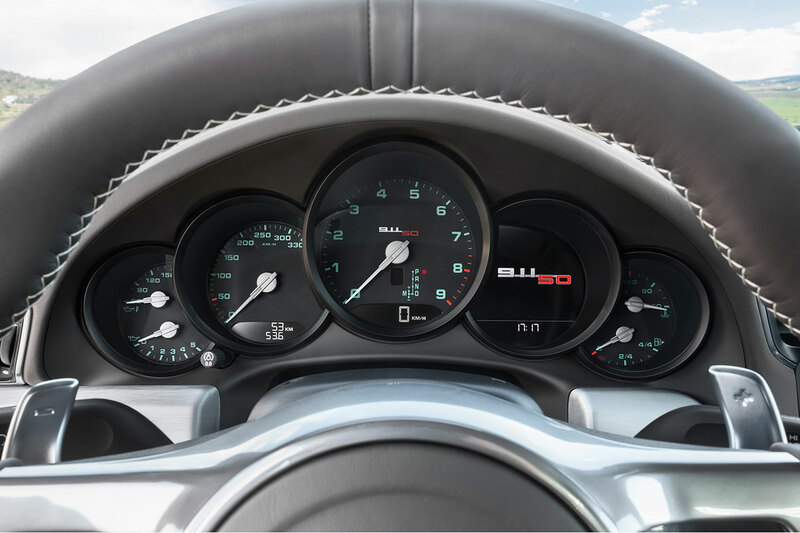 Powered by a 400 hp 3.8-litre flat-six engine, the 911 50 Years Edition sprints from 0-62 mph in 4.5 seconds (4.3 secs with PDK) and can reach a top speed of 186 mph (185 mph with PDK). The NEDC Combined fuel consumption is 29.7 mpg (32.5 mpg with PDK), which equates to CO2 emissions of 224 g/km (205 g/km with PDK). Giving a clear indication to the rear-mounted location of the flat-six power plant are bespoke chrome strips on the fins of the engine compartment grille. These are complemented with special trims on the front air inlets, and in a strip across the car between the rear lights. 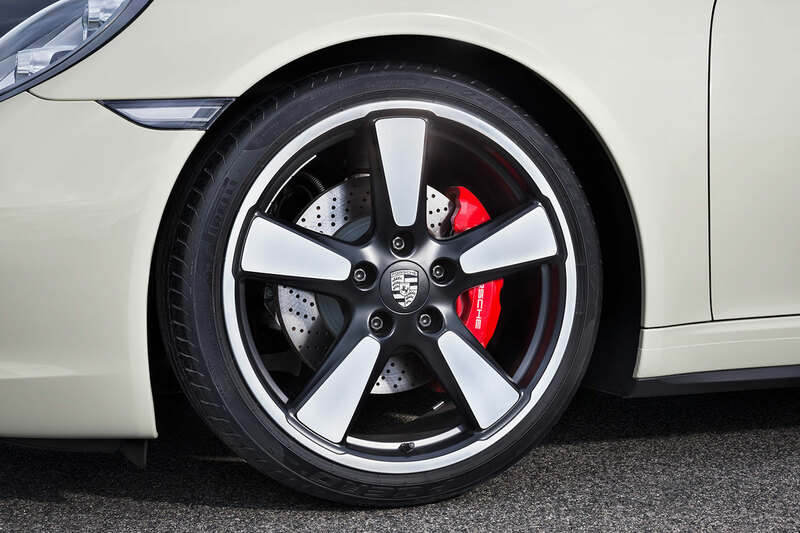 A further contemporary interpretation of 911 leitmotifs are the unique five-spoke cast alloy wheels whose style has been inspired by the so-called ‘Fuchs’ wheels, a legendary rim that was in fact a Porsche design and first fitted to the 911 in 1966. The new 20-inch diameter wheels are finished in matt black paint with machine-polished centres. Two unique colours are available for this anniversary 911; a darker Graphite Grey and a lighter Geyser Grey metallic. Black is also available. Each of the cars has a ‘911 50’ badge finished in two-tone 3D-style on the rear lid, which is repeated in three-colour embroidery on the head restraints and as a two-colour logo on the rev counter and the aluminium door sill plates. It is also displayed on the passenger side fascia strip together with the limited edition number of the individual vehicle. Other exterior characteristics of the special model are high-gloss window frames and SportDesign exterior mirrors. A technical highlight is the Porsche Dynamic Light System (PDLS), which adds a dynamic cornering function to the already standard-fit Bi-Xenon headlights. Inside, there are further styling touches reminiscent of the original 911 such as green labelling on the instruments with white pointer needles and silver caps on the instrument pivot pins. Another special feature are the centre panels of the leather seats, which are designed with a fabric pattern that evokes the ‘Pepita’ tartan design from the 1960s. 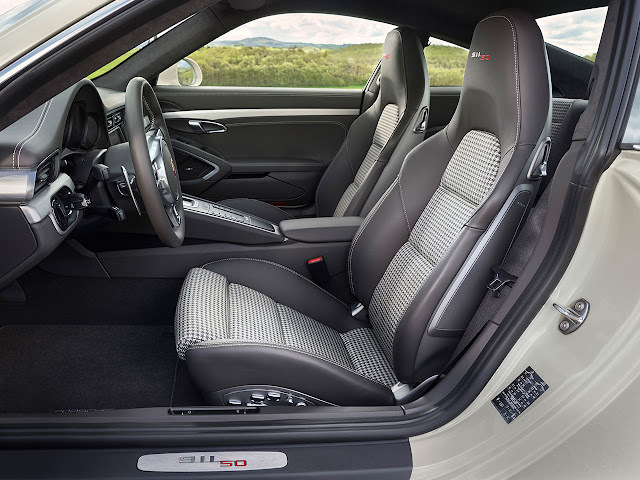 The leather interior can be specified in Agate Grey or Black with decorative stitching. Sports seats with 14-way adjustment are standard, with 18-way Sport Seats Plus available as an option. The gear shift or selector lever – which, like the decorative panels on the dashboard, doors and centre console, is trimmed in brushed aluminium – comes from the Porsche Exclusive custom tailoring programme. The 911 50 Years Edition is available to order now from Porsche Centres in the UK and Ireland, priced from £92,257. First right-hand drive deliveries will arrive in September. 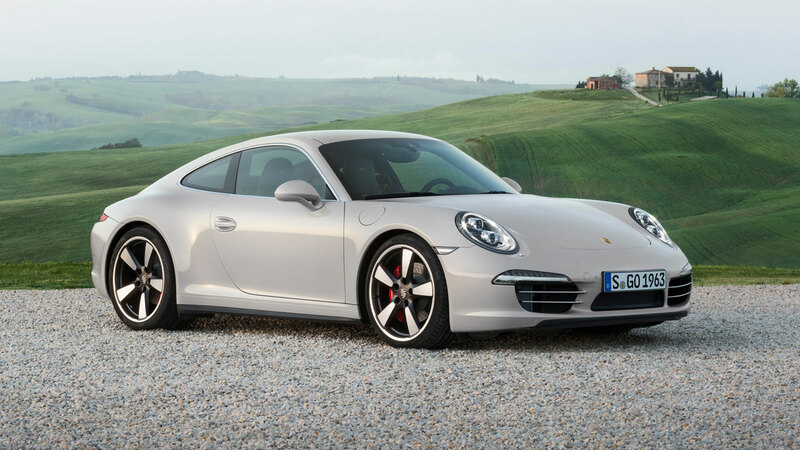 In addition to the bespoke equipment of the anniversary model, standard equipment on the 911 Carrera S includes Porsche Active Suspension Management (PASM), Porsche Torque Vectoring (PTV) with rear limited slip differential, 4.6-inch colour touch-screen Porsche Communication Management with satellite navigation, automatic climate control, Bi-Xenon headlights, a universal audio interface offering MP3 connectivity and a three year warranty.